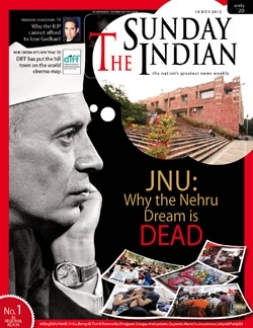 India’s Jawaharlal Nehru University (JNU) has always had an intellectually superior halo around it. The 1000 acre campus has been called the ‘Kremlin on the Jamuna’ for its strong leftist leanings, a Utopian dream for its unique culture of democracy and dissent and an intellectual fortress for its almost four decades of academic supremacy. But the lofty academic edifice seems to be crumbling in the 21st century with tales of defective admission policy, discrimination in examinations, hunger strikes by students, lack of adequate infrastructure, shortage of teaching staff and progressively increasing failure and dropout rates of students. Take for instance JNU’s prestigious BA (Hons) courses. As per last records available, almost 40 per cent of the total number of students admitted in various undergraduate courses at JNU dropped out or failed in 2010. The corresponding number for the various MA/MSc/MCA courses was 20 per cent. Scrutiny by the Comptroller and Auditor General (CAG) has revealed that during academic years 2005-06 to 2009-10, “the percentage of student dropouts as compared to enrollment during first year was in the range of 19 to 64 per cent in five undergraduate courses.” The dropout range in postgraduate courses in four centers of JNU was in the range of 15 to 82 per cent during the said academic years. Worse, the institution kept no record of the high rates of failures and dropouts as if unconcerned that this blip had any power to shake its deep-rooted sense of academic superiority. When quizzed by the CAG, university authorities merely attributed the phenomenon to students leaving for jobs or other opportunities. But is that really the case? Over the years, has not a sense of academic complacency enveloped the JNU campus teeming with green trees and mystic caves? Instead of becoming a haven of intellectuals, has JNU become a mere preparatory ground for civil service aspirants? Urvashi Sarkar, a student of International Relations at JNU believes, “A sizable number of students join JNU with an objective to prepare for the civil services examinations. Not only is it cheap, it hass a great atmosphere to study, libraries open till midnight, you can go to reading rooms any time of the day or night and enjoy free internet access.” Observers say that the institution seems to have lost its pan India character and is today mainly catering to students from UP and Bihar. Notably, JNU receives almost10,000 applications from these two states every year, while less than 1,000 applications come in from 17 to 20 other states. Today, JNU’s popular Ganga Dhaba does not resonate with heated political exchanges or ideological explosions. Instead, it is the affordable paratha and tawa chicken that lure late night birds to this mouth-watering venue. Even the library now boasts a large reading room where UPSC aspirants spend their days and a large part of the nights. Anand Kumar – who belongs to one of the first batches of students at JNU and is now a professor at the Center for the Study of Social Systems at JNU – believes that the civil services leaning among JNU students is part of the institution’s founding DNA. According to him, rumour has it that the then Prime Minister Indira Gandhi in her pro-left phase of politics created a home for leftist intellectuals in JNU. “Some of them were straightaway taken into Rajya Sabha by her,” he says, pointing towards a cozy harmony between the establishment which was pro-left in that period and the JNU academic community. “There was a popular joke in the campus community that some read Marx for revolution, others read Marx for marks. 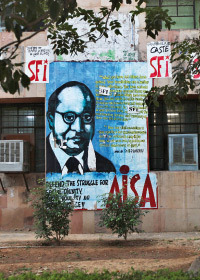 Marxists in the campus were later on found to be preparing for the IAS,” explains the professor. While preparing for the civil services is not a crime by itself, what is really frustrating for academic observers is the alleged falling standard of research studies on campus and slackening of the self-anointed goal of academic excellence for the institute. A case in point is the acute shortage of teaching staff on campus. The 2011 CAG audit points out that over 33 per cent of the total sanctioned posts in teaching cadres were vacant as of March 2010. In an interaction with TSI, JNU Vice Chancellor (VC) Professor Sudhir Kumar Sopory admits the shortage but attributes it politically sensitive disagreements related to reservations. “Certain people felt there should not be a reservation policy, while others felt there should be one. After a few meetings, we decided to have two per cent reservations for assistant professors in SC/ST/OBC and also at associate professor and professor levels,” he says, adding that 35 of the 85 vacant faculty positions have since been filled. The question is, did JNU really require a nudge from CAG to begin addressing the deterioration these vital ingredients which form part and parcel of its pursuit for excellence? Sopory who took over as Vice Chancellor about two years ago himself has a publicly-stated vision of JNU becoming one of the top 100 universities in the world. But is that even possible given the present inadequacies? “You expect students to be of international standard without giving proper books, Wi-Fi and proper hostels. At the age of 29 or 30 years when students are on the verge of completing their research and take on responsibilities for family that you stop the scholarship and leave him to fend for himself. Will he then try to fulfill his social obligations or focus on research? Why are scholarships stopped in the last year when students need it the most?” asks V Lenin Kumar, recently elected president of the JNU Student Union. “JNU has failed in its mission. The autonomous nature should have opened floodgates of research but the institution has become restricted by its limited approach,” says Krishna Kumar, New Delhi based education consultant. Among other reasons, including ineffective use of grants for sponsored projects/fellowships, a seemingly innocuous indicator hampering research activities by students and faculty has been the casual approach towards installation of equipment in various labs of the institution. A Transmission Electron Microscope purchased in October 2007 for Rs 245.72 lakhs, for instance, was installed in JNU’s Advanced Instrumentation Research Facility after a delay of more than a year. This casual approach is by no means an isolated incident. CAG’s examination reveals that as many as 30 pieces of equipment purchased by JNU for Rs 10 lakh and above were installed with a delay ranging from 3 to 23 months between 2005 and 2010. The faculty has not got it any better. “At any given point of time, 25 per cent of the faculty is living in one and half room apartments – the so called transit houses which are more like pigeonholes. The infrastructure planning at JNU is very deficient. The classes which were made for about 50 students have to accommodate more than 70 students now,” avers Anand Kumar. Pointing around his office, the professor adds that his room becomes a furnace during April to August every year. “The electricity and water crisis is acute. In the last fortnight, for five days we had no water supply at all,” he says. Agrees Pushpesh Pant, former Professor of Diplomatic Studies at JNU. "The university's ‘new’ schools – Life Sciences, Environmental Sciences and the School for Arts and Aesthetics – are approaching middle age. Some have acquired an enviable reputation and continue to attract promising scholars. But the rate of attrition is quite high," he rues. What is more disheartening is that the inability of JNU to build its physical and academic infrastructure as per requirements is despite its coffers being flush with funds. As per the 2011 CAG report, the University did not use almost 31 per cent of its infrastructure grant and its savings in grants increased from about Rs 7 crore in the year 2005-06 to almost Rs 38 crore in 2009-10. Meanwhile, the shadow of the CAG report and errors and omissions of the past will remain etched on the campus. Clearly, something somewhere has gone amiss in this Nehruvian dream of academic and intellectual excellence. 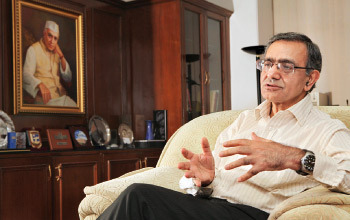 "JNU has to be No.1 within the country"
JNU Vice Chancellor Sudhir Kumar Sopory talks to Aditya Raj Kaul about the past, present and future of problems and prospects for the university. How challenging have the last 20 months as the JNU VC been? There are a lot many things that have not changed in JNU but some things have changed. The open culture of JNU, space for everybody to express viewpoints and interactions have continued over years. But there are fewer interactions between various faculties. Initially because the old schools and centers were of very small size, there was lot more crosstalk. As the number of faculties increased to 500 and students are almost 7000, that interaction and understanding among teachers has slowly reduced. One of the challenges for me since I came has been to bring that culture back. We should have more seminars and discussions. In fact, for the 12th plan we have suggested to create such trans-disciplinary clusters where we can initiate new innovative programmes. The CAG report says that funds allocated for infrastructure in JNU were left unspent. What have you done? The performance audit by CAG came just when I joined. We have responded to all the issues. The final report after our response has dropped most of the charges. A system has been built up where accountability for each officer will be there. I think from the financial point of view, we are much more robust but for the rest, it will take time. Infrastructure grant was not transferred; there were certain problems with it. The grant for buildings was utilised. By and large, things are under our control. The teaching positions were vacant because certain people felt there should not be a reservation policy, while others felt there should be. We have reconciled many issues now and out of 85, we have filled 35 positions already. The student union recently was on a hunger strike with long pending demands. Have you reached a consensus with them? The students told me that there is some discrimination at examinations. I never felt that faculty can discriminate. There could be discrepancy but not discrimination. However, the data produced by students was compelling. I told them in the last academic meeting that as a scientist, I look at data. Instead of taking only specific cases, why not evaluate the data of last five years. The students wanted me to take a decision on it as an administrator. Even before we could come to any conclusion, they sat on a hunger strike. My personal idea is that such academic matters should not be left in the hands of the administration alone. There needs to be a discussion and a decision with mutual understanding. We have constituted a committee to look into the specific demand of reducing the viva marks. But the students chose to continue with the strike. You said you would like to see JNU among the top 100 universities in the world. Have you earmarked a deadline? Each ranking agency has its own parameters. I think this ranking too is something within my mind. I think JNU has to be No 1 within the country in terms of academic output. We need to have some new innovative thought and programmes and the quality of research that we produce has to be good. For any university to excel, its academic output has to be of a very high quality. This has to be coupled with other facilities on the campus. We are going ahead with recruitment of good faculty as it has not taken place for quite some time. Once the faculty takes charge, they will take the university to the top ranking. It is on the path but will take time. JNU has never had a placement cell. Will there be consensus on it now? I think we have already been able to convince most people. I had a meeting of all deans a few weeks ago where we decided to have a placement cell. I am happy that this demand has come from the students' union. This time, we are going to put it in place. The CAG report states that JNU mostly caters to students from UP and Bihar? Can you change that? Numbers do not tell the real story. We just finished the admission process for the new session. UP, Bihar, Delhi and Rajasthan are areas from which the number of students appearing is large. If you take the ratio of how many appeared and how many got through, the ratio is still small. In quantitative terms, you might see that 5 or 6 states are doing better than the rest. There is no discrimination; students come from all over.